Signs are ubiquitous, an essential piece of branding for businesses around the globe. We’ve been told not to judge a book by it’s cover, but it’s not that simple. Signs and logos express a brand’s personality and, when done right, give a picture of a specific industry, product, or showcase an experience. So what does a neon sign communicate? Glam. Glitz. Flair. Excitement and plenty of it. There’s not a city more exciting than Las Vegas, home to miles of brightly lit streets and neon signs promising fun and frivolity to 41 million annual visitors. 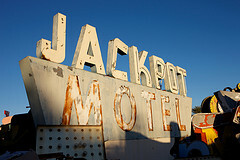 The heart of the Las Vegas strip, as well as it’s downtown core, have been refreshed over the past 20 years, leaving a very short list of original casinos and their iconic neon signs. The Flamingo, Circus Circus and the Tropicana still shine bright, but many of their contemporaries have been replaced by newer concepts. What happened to the iconic signs from the Stardust, Binion’s Horseshoe and Caesars Palace? 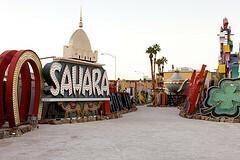 They’ve joined countless other neon artifacts at the one and only Neon Museum, of course. 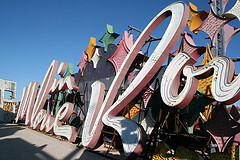 The Neon Museum, founded in 1996, is a non-profit dedicated to collecting, preserving and exhibiting iconic Las Vegas signs for education and cultural development. The indoor/outdoor museum ten minutes from the heart of the Las Vegas Strip, houses more than 200 unique signs, each notable for their design and heritage. 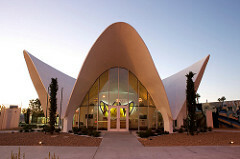 Visitors enter through the former La Concha Motel lobby, which also houses the museum’s visitor center, and then move on to the legendary Neon Boneyard. The two-acre Boneyard, made famous by countless celebrity, fashion and lifestyle photo shoots is quite a draw. 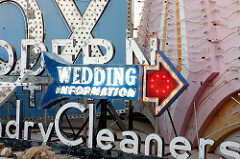 Docents lead tours through the Boneyard, sharing unique stories about the personalities who created the signs, their inspiration, point of origin, and the role the sign played in Las Vegas’ colorful history. 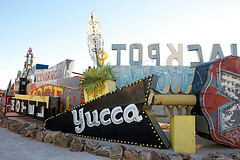 The Neon Museum strives to educate the general public to changes and trends in sign design and technology from the 1930’s forward. We joined up with the Neon Museum’s Executive Director, Danielle Kelly, to learn more about this institution and ogle some signs. 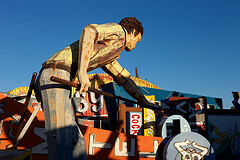 The Neon Museum offers visitors a unique opportunity to get up close and personal with some of the most iconic neon signs, EVER. Can you tell us how one sign turned into a full-fledged museum? The process is ongoing. Las Vegas is famous for reinventing itself and that means lots of old signage is torn down to be replaced with something new. Fortunately, back in 1996 the local community recognized the artistic and historic value of this discarded signage and created the museum as a way to preserve it. 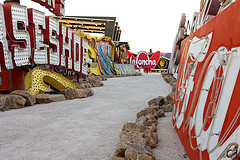 We offered tours of the growing collection for years, and in 2012 we were able to open this dedicated space, complete with a visitors center, events space and carefully curated outdoor exhibition space, the Neon Museum Boneyard. How does the museum acquire new pieces? Typically, they are donated by the owners of the property that discard the signs. 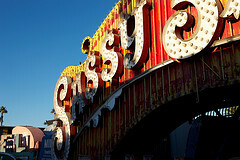 We’ve seen so many great fashion shoots with the Neon Museum serving as the set. How has editorial helped to boost traffic and awareness? We’re fortunate that the museum is so photogenic and that press coverage, indeed, appears all over the world. Since opening to the public for regularly scheduled tours and programs in 2012, we have heard time and time again that people found out about us by seeing beautiful photo spreads or reading rave reviews about the museum in the press. What role does education play in the museum’s overall mission? 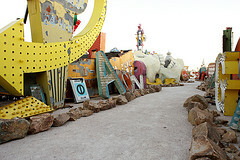 Education is everything at the Neon Museum. That is why we exclusively offer guided tours with expert docents, so every visitor who comes to the museum receives an oral history about not only the signs they see in the Boneyard, but also the time and place in Las Vegas it represents. We also talk about the innovative or unique architectural and design elements of the signs, and the designers that made them possible. 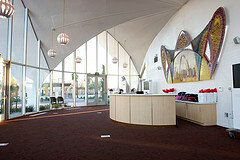 Our visitors are routinely amazed by how much they learn about Las Vegas’ visual and cultural history on our tours. And of course, being Las Vegas, that history is guaranteed to be very entertaining. Is there a particular Museum piece or collection that visitors seem to flock to time and time again? Everyone has their favorite…but the Stardust sign (top) is one of our most popular. It’s extremely recognizable and very much loved by visitors the world over. It’s a classic icon and makes for an irresistible selfie op. 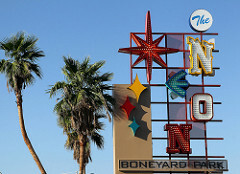 Step up your Las Vegas selfies and plan your visit to the Neon Museum in Las Vegas, today!